GOETHE’s “Faust” has inspired four large works of the first rank, each in a different form—an opera, a concert overture, a symphonic poem, and a secular oratorio more particularly designed by its author-composer as a “dramatic legend.” The last pair, which are Liszt’s “A Faust Symphony” and Berlioz’s “Damnation of Faust,” are now simultaneously available on long playing records and naturally invite comparison—not only because the two works are alike performed in an uncommonly satisfactory manner. More than that, the two scores are historically linked. Liszt, who was Berlioz’s lifelong friend and one of his earliest champions, told his confidante and biographer, Lina Ramann, that Berlioz’s “Damnation” occupied much of his thought during the years of incubation of the “Faust Symphony.” When it was finished he duly dedicated it to his older friend. In form and conception, however, no two works could be more unlike. The symphonic poem in three parts is really a set of endless variations on characteristic themes designed to establish three moods, to draw three portraits— those of Faust, Gretchen, and Mephisto—with suitable contrasts within and among them to adumbrate the drama. A short vocal finale resolves the diversity into a reconciled unity. If the work is deservedly popular and has a right to be called Liszt’s masterpiece in symphonic idiom, it is because the characterization on the one hand, and the musical substance on the other, are equally apt and stand throughout in equipoise. Liszt’s fondness for short and somewhat portentous themes is here justified and redeemed by great versatility in twisting and turning them to new use, so that they retain their freshness and make iteration agreeable. None builds up or branches out into any long melodic statement, but the impression of melodiousness is real and the harmony is as telling as the scoring is exquisite. The performance of the Paris Philharmonic Orchestra preserves all the delicacy of the intended coloring, though in certain passages Mr. Meyrowitz’s bad habit of languishing over phrases detracts from the strength or purity of the idea. This is especially noticeable in the Gretchen section. It is curious, incidentally, how often we are reminded of the earlier “Fantastic” Symphony and the later operas of Wagner, without ever feeling that what we hear is an echo or the source of an adaptation. Liszt’ s voice is here his own, as in some of the great piano works. In this record the tenor (whose name is Miguel Villabella and not, as the label says, Georges Jouatte) sings with a proper sense of his limited role, so that the admixture of voice (including the brief choral passage) gives no feeling of sudden change or top-heavy cornice-work. IF Liszt’s Symphony is a masterpiece of truthful portraiture and musical tact, Berlioz’s “Damnation of Faust” is one of dramatic conciseness and overflowing melodic gift. It must be heard as a Shakespearian play, in which each scene yields several things at once: a slice of life, characterization, plot movement, and pleasure for the ear. There are in the “Damnation” twenty scenes grouped in four parts, exactly as the excellent translation of the text shows us on the back of the record envelope. Hence it is mildly irritating to find the records labeled Act I, etc., which will only strengthen the old error that the work is an opera. The fact is that any suggestion of visualizing is detrimental to the proper enjoyment of this particular music, let alone the fact that judged as opera its construction must appear arbitrary. The title “dramatic legend” is there to remind us of the Faust story, from which we are given the high spots in vivid kaleidoscope. They are linked together by recitatives which form not the least magnificent part of the dazzling score. For passion and precision they belong with those in the “St. Matthew Passion,” “Don Giovanni,” and Gluck’s “Alceste.” Those that Georges Jouatte sings as Faust deserve all praise for execution and it is a pity that he is not matched in this recording with the transcendent Mephisto of Panzéra, who sang in the earlier HMV version. Cabanel is adequate to the part, nothing more. Besides the recitatives, the listener will discover with pleasure the new role which the well-worn orchestral excerpts (“Hungarian March,” “Sylphs,” and “Will o’ the Wisps”) play in the total scheme. The last named is especially well done by the Radio Paris orchestra under the direction of Jean Fournet, and it regains all the sinister, even tragic, quality which years of absent-minded use as filler have rubbed off it. The variety of forms and moods in the “Damnation” is at first bewildering and leads to predilections which repeated hearing tends to even out. The listener is at once captivated by Gretchen’s two great songs, by the Easter chorus and the Enchantment scene; and he may find the love duet, the trio, and the three scenes before the conclusion less inspired because less winsome. But dramatically and musically they carry their weight, and it would be hard to say what should or could replace them. As regards performance one might be captious and wish that a stronger orchestra should be playing throughout—stronger in numbers and in sinew; but in all the gentler scenes it functions admirably. Again, Mona Laurena sings Gretchen a trifle unevenly. She is at her best in the love duet and later lament, though her faults of breathiness and misplaced volume rather harm the King of Thule. It is the chorus that shares the honors with Jouatte for sustained quality of tone and musicianship in difficult as well as easy passages. Indeed, they “respect” the Amen fugue so much that they fail to give it the required touch of vulgar bawling at the end. A comparison of this group of French singers with choruses of other nationalities who have sung the work shows the correctness of Berlioz’s judgment in writing predominantly for three and six parts. As he says in his “Treatise,” that is how French voices naturally distribute themselves, and consequently how one must combine them to obtain that full and yet internally distinct conjunction which we hear in these records. 1. 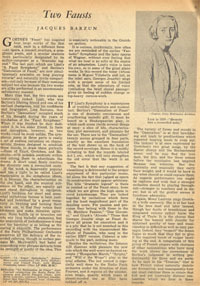 This article has been transcribed from a contemporary copy of the Saturday Review of Literature, 28 June 1951 (page 37) in our own collection. We have preserved the author’s original spelling, punctuation, and syntax. 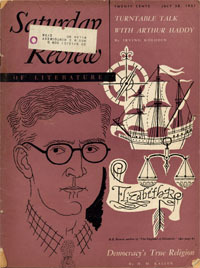 We have not been able to contact the editor of the Saturday Review of Literature, which has ceased publication. The Hector Berlioz Website was created by Monir Tayeb and Michel Austin on 18 July 1997; this page created on 1 May 2011. © Monir Tayeb and Michel Austin. All rights of reproduction reserved.